Dr. Miyagawa is a M.D., Ph.D., Associate Professor in Division of Organ Transplantation, Department of Regenerative Medicine, Osaka University Graduate School of Medicine. After graduate at Hokkaido University Medical School in 1981, he joined the First Department of Surgery, Osaka University Medical School, and was trained in general surgery and cardiovascular surgery during his residency. In addition to medical training, he became involved in research on the mechanism of discordant xenograft rejection, especially the activation of the alternative complement pathway. He received his Ph.D. degree at Osaka University Medical School in 1989. After serving as a fellow in the Division of Immunology and Organ Transplantation, Department of Surgery, University of Texas Medical School-Houston, USA, he resumed research in xenotransplantation in 1990. From 1994 on he has been involved in studies of basical glycobiology, especially glyco-antigen, aimed at reducing xenoantigenicity by means of enzymatic remodeling. His current research interests include the production of transgenic and knockout pigs. Dr. Shirakura is a M.D., Ph.D., Professor and Chairman of Division of Organ Transplantation, Department of Regenerative Medicine, Osaka University Graduate School of Medicine. After graduate at Osaka University Medical School in 1968, he joined the First Department of Surgery, Osaka University Medical School, and was trained in general surgery, pediatric and thoracic cardiovascular surgery during his residency. After worked for several years in different hospitals as research and clinical fellow, he backed to Osaka University Medical School and became involved in research on transplantation immunology, especially tissue typing. He received his Ph.D. degree in 1976. After serving as an honorary fellow in the Royal Society of London, Department of Cardiovascular surgery in June1980- March1981, he resumed the research on organ procurement and preservation. He became Associate Professor in 1990, and Professor and Chairman of same as above in 1994. His current research interests include xenotransplantation study, especially transgenic and knockout pigs. Professor Taniguchi graduated from the Hokkaido University School of Medicine and obtained M.D. in 1967, and completed the doctoral course of medicine at the Graduate School of Hokkaido University and obtained Ph.D in 1972. He was then appointed an assistant professor at the Hokkaido University School of Medicine in 1975 and appointed a visiting associate professor, Department of Biochemistry Cornell University Medical College, New York at the laboratory of Dr. Alton Meister between 1976 and 1977. He was appointed an associate professor, Graduate School of Environmental Science, Hokkaido University in 1977 and later appointed an associate professor, Biochemistry Laboratory Cancer Institute, Hokkaido University School of Medicine in 1980 at the laboratory of Dr. Akira Makita. He was appointed as a Professor and Chairman, Department of Biochemistry, Osaka University Medical School in 1986. He received a Grant in Aid for Scientific Research on Priority Areas entitled "Sugar remodeling and cellular communications" from the Ministry of Education, Science Sports and Culture, Japan between 1998 and 2000. He is an honorary member for the American Society for Biochemistry and Molecular Biology. He will receive International Glycoconjugate Organization (IGO) Award, and Docteur Honoris Causa of the University Henri Poincaré in 2001. The president for the Annual Meeting of the 74th Japanese Biochemical Society in 2001. Editorial board members: J. Biol. Chem., Glycobiology, Glycoconjugate J., Biochem. Biophy. Res. Commun. (from March 2002). The increasing problem of a worldwide shortage of donor organs has led to a revival of interest in xenotransplantation. Xenograftings can be classified as either discordant or concordant, such as pig to human or monkey to human, respectively, based on the severity and pattern of the graft rejection. Trials designed to overcome hyperacute rejection by the expression of complement regulatory proteins, such as membrane cofactor protein (MCP; CD46), decay accelerating factor (DAF; CD55) and CD59 (MACIF, HRF20) on the graft has been shown to be quite effective.6 As the next step, trials, designed to overcome hyperacute rejection and acute vascular rejection, which is characterized by the presence of xenoreactive antibodies and the subsequent activation of graft endothelium, the activation of small amounts of complement, and incompatibility of the coagulation system, by modification of the glycosyltransferase(s) using gene technology are currently underway. The α-galactosyl epitope biosynthesized by α-1,3galactosyltransferase, is highly associated with hyperacute rejection in pig to human xenotransplantation. Variety of strategies have been pursued to reduce or eliminate this epitope from pig tissues. In terms of α1,3GT activity in organs, the mouse expresses a relatively lower α1,3GT activity than the pig in many organs. The differences are in the 10-fold range, except for the lung, based on our investigation.12 Galili et al also concluded that α-Gal epitope expression in pig organs is up to 500-fold higher than in mouse organs. Problems continue to exist regarding α1,3GT K.O. pigs, including severe deformity or lethality. Sandrin et al reported, at the VI Congress of the International Xenotransplantation Association, that pig has two α1,3GT, that is GT1 and GT2. They clearly encode GT2 as a different gene from GT1, and the potency of GT2 for producing the α-Gal epitopes has been clearly demonstrated by staining with the Griffonia simplicifolia 1 isolectin (GSIB4 lectin), which bind to the α-Gal epitope.13 Concerning the existence of this gene in the pigs, further studies will be required. 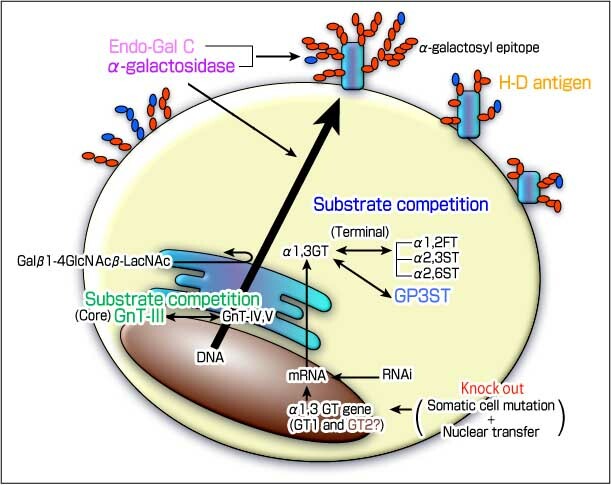 A variety of strategies, designed to downregulate the α-Gal epitope have been reported. One of these involves controlling sugar chain biosynthesis using the β-D-mannoside β-1,4-N-acetylglucosaminyltransferase III (GnT-III) enzyme, which leads to a remodeling of the total antigenicity of the cell surface. Our previous studies showed a reduction in α-Gal epitope expression , in the case of pig endothelial cell transfectants. GnT-III catalyzes the branching of N-linked oligosaccharides to produce a bisecting N-acetylglucosamine (GlcNAc) residue. The attachment of a bisecting GlcNAc inhibits the further processing of oligosaccharides by other glycosyltransferases. That is, once a bisecting GlcNAc residue is added to the core mannose by GnT-III, the action of other competitive enzymes such as α-3-D-mannoside β-1,4-N-acetylglucosaminyltransferase IV (GnT-IV) and α-6-D-mannoside β-1,6-N-acetylglucosaminyltransferase V (GnT-V) are prevented from introducing any additional tri-antennary structures into the Golgi stack. As a result, it is likely that α-Gal epitope levels are decreased because the bisecting GlcNAc suppresses the further processing of complex-type sugar chains. A novel sulfotransferase, glycoprotein-3-sulfotransferase (GP3ST) shows sulfotransferase activities toward oligosaccharides that contains nonreducing β-galactosides. GP3ST is able to act on both type 1 (Galβ1-3GlcNAc-R) and type 2 (Galβ1-4GlcNAc-R) chains with a similar efficiency. The functional feature of GP3ST to the α-gal epitope belongs to the terminal enzyme competition group, such as α1,2FT and α2,6ST. Because the substrate specificities of GP3ST are nearly the same as α2,6ST. The Hanganutziu-Deicher (H-D) antigen, which contains N-glycolylneuraminic acid (NeuGc) is widely distributed in mammalian species, except for humans. The expression of NeuGc is controlled by cytidine monophospho-N-acetylneuraminic acid (CMP-NeuAc) hydroxylase activity. The absence of NeuGc in human glycoconjugates is due to a partial deletion in the gene that encodes CMP-NeuAc hydroxylase.26,27 Therefore, this epitope has the potential to become one of the largest epitopes in the pig to human xenotransplantaion after α1,3GT is knocked out. Several strategies for reducing this antigen in pig cells are under consideration and include the K.O. of CMP-NeuAc hydroxylase gene.28 Fortunately, it is also possible for GnT-III to reduce the levels of the H-D antigen, because GnT-III does not act exclusively on an α-Gal. Concerning other glycosyltransferase, the transgenic pig carrying a high level of α2,3ST activity or α2,6ST is difficult to produce, judging from our previous experience. 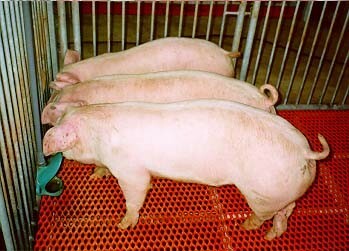 We have been successful in generating several lines of transgenic pigs that contain the human GnT-III gene. The overexpression of the GnT-III gene in pigs reduced their antigenicity to human natural antibodies, especially the α-galactosyl epitope as evidenced by several analysis. Further attempts to eliminate xenoantigenicity might be required in order to achieve successful clinical xenotransplantation.